Very rare, a label sent me by LJC reader Eugene M, looks like a vintage Interdisc-licensed Riverside title pressed by Victor, from the ’60s (a 1962 recording). The pressing die ring is almost deep groove, not seen since the early ’60s. Fantasy Records, owners of both the Riverside and Prestige labels since 1972, will have been aware of the success of United Artists with the Blue Note reissue programme in Japan. To capitalise on its own jazz catalogue Fantasy licensed Victor Music Industries to reissue select titles from their Prestige, New Jazz and Riverside catalogues. 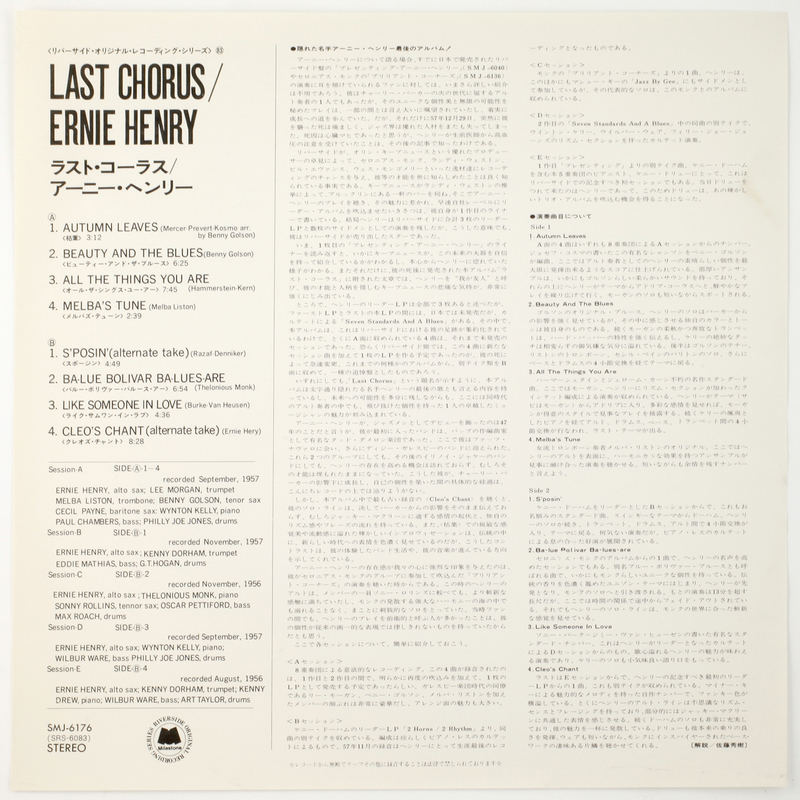 Cheekily, Fantasy issued some recordings by altoist Ernie Henry – a little known name as he died soon after, hence the album title, but the recording session featured numerous high profile names from the Blue Note world. Victor are a bit of a mixed bag. Some are fine, but too often the top-end is rolled off and lacking in dynamic range, something engineers thought countered tape hiss, but which stunted the sonics at the same time. I recall not being very impressed with the sonics, somewhat bland, lacking the visceral punch you would expect from a lineup like this. Recorded for Riverside in 1956. 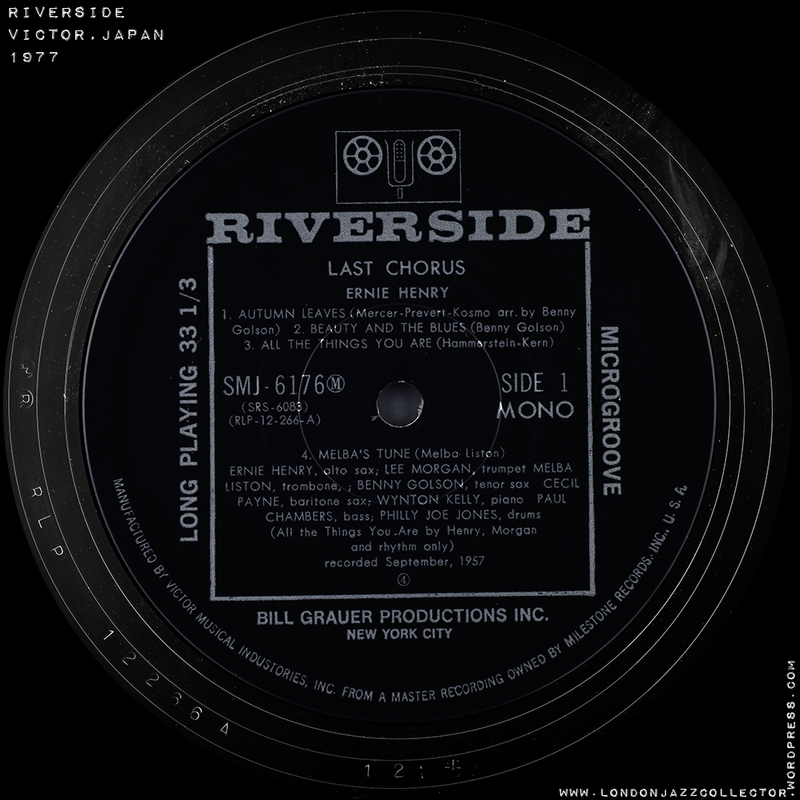 The use of the Milestone label design rather than Riverside may be connected with Orin Keepnews , who was head of Riverside, which filed for bankruptcy in 1963. Orin then founded Milestone in 1966 to continue publishing music. Virtually all Riverside masters were acquired Fantasy Records in 1972 but perhaps some like this remained in the ownership of Keepnews and Milestone. I have near 10 Japanese releases on blue Riverside label (one of them is mono). And all of them sounds great, even when conditions are far from excellent. Hi, thanks for your observations, SomS. Do you have an indication of when yours were manufactured? I ask this because I have a number of Japanese reissues of Milestone/ Riverside and to my ear they are mostly all terrible in comparison to originals. I wonder if there is a legacy issue, about recordings reissued at different times. On previous occasions I have found good and bad reissues from Japan, and the copies from the Fantasy years have included very poor transfers, which I put down to what Fantasy sent, no reflection on Japanese engineering. Have you been able to compare Japan reissues with US originals? Sorry for the delay with reply. Releases with blue labels were pressed in the begging of 60’s – some of the them has a year (for example, Bill Evans’s Portrait in Jazz). Also, sometimes ago, I found short message of one Japanese who compare five issues of Waltz of Debby, including issue with blue riverside label and split-issue Waltz for Debby/Village Vanguard pressed on Fontana label (by the way, I also had it if it interesting to you). This man indicated issue with blue label as 1962. One more sign of early 60s issue is a form-factor of sleeve. Such type of back-side (as you can see on your photo) was used on all Victors releases in the eraly 60s. Later releases had not arc in the top and in the bottom. I can send you photos of my releases (I bough some more including Monk’s Brilliant Corners, Evan’s Explorations, Coltrane and Monk common release, etc.). If we a talking about compare with Riverside US – I didn’t compare it because unfortunately I had not 2 copies of the same release. By the way, I agree with you about later reissues of Milestone/ Riverside, especially SMJ and VIJ series. I bought several when start to collect vinyl and stopped to buy it. As for me, sonic is very similar to the sonic of CD – clear but plastic. If we are talking about first Japanese issues (on blue label) I read (but not sure it is absolute true) it was pressed from US matrix. Always glad to receive comments, widen all our collective view, we all have a only partial view from limited experience, pooling experience is helpful. Some time in the future I need to do a more up to date and comprehensive review of these labels and their Japanese reissues, but sadly that time is not now, but I will get around to it. Just thought I’d add one more contribution to the early Riverside / Victor Japan pressings. I just uploaded to Discogs photos of a very clean copy of Monk’s Music released by Victor Japan (here: https://www.discogs.com/Thelonious-Monk-Septet-Monks-Music/release/12707046) . Confusingly, the record says on its label that it was produced by Victor Japan while the back of the jacket says it was produced by Fortuna via licensing from Interdisc S.A. I researched the Victor Japan series this album and others were released through. The series – which also seems to have included titles from Pacific Jazz and other labels – started in 1959 and seems to have continued into the early 1960s, according to a few Japanese Web sites I read. From the best I can tell, the earlier King and Victor Japan pressings – maybe into the mid-1960s – never included obis or inserts. Instead they printed linear notes from Japanese critics on the back of the jackets in the native language. As has already been mentioned, they also use the “European style” thin cardstock for the jackets themselves. The sound on Monk’s Music is good – definitely not rolled off. The dynamics seem fine, but I don’t have an original to compare it to (and given what early U.S. pressings of this title go for, particularly those at least as clean as this one, I probably won’t find out anytime soon). It sounds close enough in overall quality to original Riverside pressings I do own from Monk and others that I would recommend the early, blue-label Japanese Riversides. Does the sleeve of your copy have a flip? Not long time ago I bought mono Japanese Unique Thelonious Monk on blue Riverside label ( photos of my copy you can see there https://www.discogs.com/Thelonious-Monk-The-Unique-Thelonious-Monk/release/10828028 ). My copy has flip with the year of release (you can see it on one photo), but most other records (also on Japanese pressing with blue Riverside label) have not such flips. And by the way, this issues (on blue Riverside label) have not insert (you right – Japanese notes were pressed on the back of sleeve) but they have obi. Usually it was not width, has a blue color (sometimes – yellow) with short info on Japanese. I’ve become more and more impressed with many of the Victor Riverside releases…they certainly used better vinyl than original Riverside releases. How about a couple of your famous side by side comparisons between the 2? Updated with some more on the Green Milestone label. The line up of both the Ernie Henry releases are remarkable but I recall being quite disappointed with the quality of the transfers by Victor, though it is hard to know at whom to point the finger. 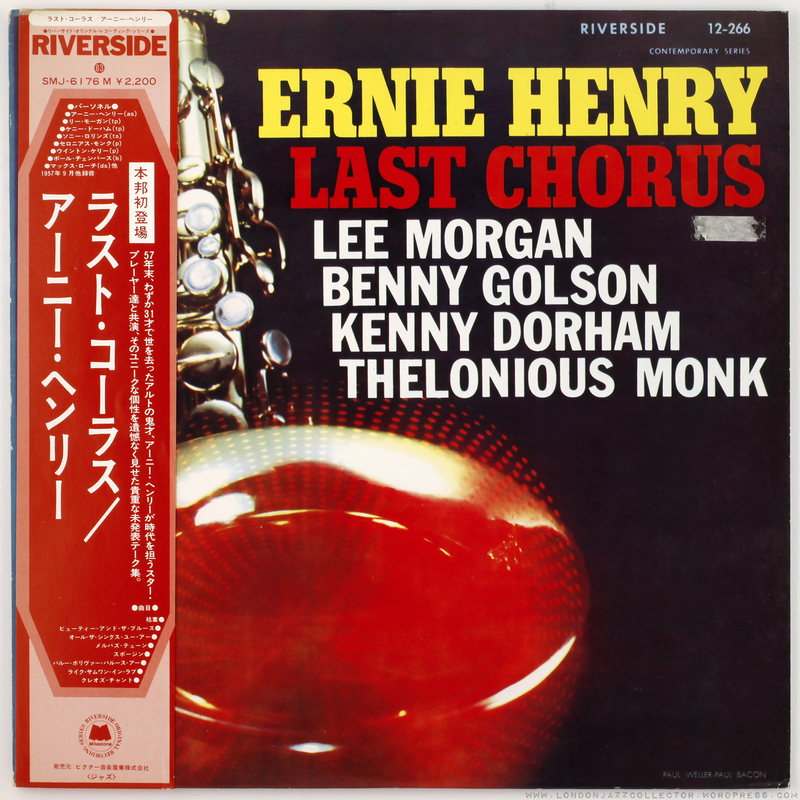 There is also a Presenting Ernie Henry on Victor Japan with Kenny Dorham and Kenny Drew from a 1956 session. I have this on a green Milestone label from Victor from Riverside Sonically very good. Do you have any knowledge of the Green Milestone labels from Victor Japan?